World Tour Finals, Round Robin. As innovations in sports coverage go, the two tendencies with the patchiest success rate have typically entailed attempts to introduce more technology into proceedings and vain efforts to bring viewers closer to the players, or vice versa. The former tendency gave cricket the third umpire. The latter gave tennis those idiotic pre-match interviews, upon which it is impossible to heap too much ridicule. Unsurprising therefore was Sky Sports’ latest innovation, which was to amalgamate these two tendencies into a single, and potentially unholy, feature. Within minutes of each match concluding the victorious player was invited up to the studio, whereupon he was sealed in a room with Mark Petchey and forced to analyse key moments from the match on the Sky Pad, a large interactive touchscreen. It seems like a response to a madman’s dream, but the result, to my surprise, is not half bad. New technology and live television are generally a recipe for disaster, but this worked surprisingly well. (Petchey probably isn’t integral to the enterprise, but he has obviously spent thoughtful hours mastering Sky Pad’s intricacies.) One doubts whether it would be half as successful if they invited the losing player along. It’s also not an exercise that would work for every player, since many aren’t especially voluble even in victory. Tomas Berdych and Novak Djokovic were about the best of them, chatty, thoughtful and affable. Indeed, Berdych remarked unprompted that he actually found it quite valuable to look at the match this way, while it remained fresh in mind. He was invited to discuss the point whereby he’d gained the break in the first set, concluded with a fine backhand volley. He revealed that as he was lining the shot up his mind had flashed back to an identical volley he’d duffed in a different tournament, and was mostly determined not to repeat it. It would have been nice to hear from David Ferrer or Richard Gasquet, but of course that wasn’t possible. Both went home winless. Gasquet also went home with fewer coaches than he’d arrived with. The final round robin match between he and Djokovic will hopefully – though probably not – provide a useful counter to those who scream ‘Tank!’ every time a player loses a match they statistically shouldn’t. Too often the loudest shrieks emanate from the player’s own fans, meaning that for many poor sportsmanship is preferable to merely losing – a sign of bad times. But if ever a player had good reason to tank a match, this was it. The result would have no effect on the final group standings: Djokovic had already topped the group, and it was already decided that he’d face Wawrinka in the semifinals. Furthermore, he’ll be playing that semifinal in under twenty-four hours, against a Wawrinka who has enjoyed an extra day’s recuperation, and who’s already driven Djokovic to the edge several times this year. Beyond that is a final with either Nadal or Federer. Assuming the Serb gets through all that, he then has the Davis Cup final next week. But he didn’t tank: he played on, sometimes desperately, sometimes grimly, often loudly. I’m not convinced his decision to do so merits applause, since not throwing a match is hardly an act of nobility, although it is being treated as such. In bad times you take what you can get. I’ve no doubt that tanking does occur in professional tennis, but I do doubt whether it occurs as frequently as cynics suggest, especially the ones whose cynicism forms a world-weary veneer for naivety. In this case it reveals a failure to grasp that the pride of elite athletes exists at a depth that can be hard to fathom for those of us operating nearer the surface, and impossible even to sense for those who’ve never achieved anything of note. Djokovic was entirely conversant with the benefits that tanking this match would confer, and undoubtedly the possibility did cross his mind. Perhaps he even discussed it with Marián Vajda. But he doesn’t like to lose any match, which is part of the reason he has now won twenty of them in a row, stretching back to the US Open. This streak isn’t so impressive for its length – Djokovic himself has posted longer ones in recent years – but for its quality and its circumstances. He hasn’t lost a match since he lost the number one ranking, and of those twenty victories, half have been against top ten players. One of them was against Wawrinka last week, and he’ll certainly fancy his chances tomorrow. Wawrinka’s passage to the semifinals is a suitable reward for a superb season, which included a final in Madrid, a semifinal at the US Open, and myriad strong performances elsewhere. His key result this week was the defeat of Berdych on the opening afternoon, especially the excellent third set. It was arguably the key result for Berdych as well, although the Czech certainly had his chances against Nadal yesterday, and by winning would have broken Wawrinka’s heart. But Nadal survived his only fraught moments this week, and by winning ensured a vast outpouring of goodwill towards Wawrinka, who is like Ferrer in that all the main fanbases are united in their approval of him. As with Ferrer, it’s much easier to bestow affection upon a guy who almost never beats your favourite. We can say that Wawrinka is unlucky to face Djokovic in the semifinals, against whom he is 2-14. But he is a combined 1-24 against the other semifinalists. Adorable. Mind you, Wawrinka temporarily alienated a few fans when he complained that Toni Nadal’s coaching had grown sufficiently ostentatious that even the umpire might be prevailed upon to sit up and take notice. The Swiss entreated the chair to issue another warning, but none was forthcoming. Nadal was more obliging, and requested his uncle tone it down: “Wawrinka is one of the players that I have a better relationship with on tour. I felt sad during the match that he felt that way. I told him ‘I’m sorry, it’s not going to happen again’. That’s why I told Toni to stop because the relationship is more important than any match.” That’s class. Afterwards Wawrinka worked it out with Nadal and his coach, another example of the players resolving a minor issue amicably behind closed doors, while outside their more deranged fans mobilised, whipped themselves into a wild frenzy, then drowned in the collective froth of their own rabidity. The difference, one suspects, is that the players have more important matters to think about. The match itself was close, although in Nadal’s case he was only close to losing a set. This would have been the first one he’d ever dropped to Wawrinka, so that particular record remains pristine. 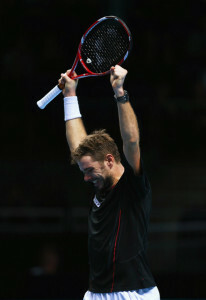 Wawrinka then took his vestigial frustration out on Ferrer, as everyone has all week. Ferrer failed to win a match at this year’s tour finals, proving once again how cruel the format can be. This has been the Spaniard’s best season, at least numerically, but it has ended in four consecutive losses. He did himself no favours by choosing to play for seven straight weeks, reaching three finals in the penultimate three weeks, and winning none of them. He has conceded as much afterwards, though I expect his schedule next year will be exactly the same. The most exciting match of the round robin phase was undoubtedly today’s between Roger Federer and Juan Martin del Potro, who’ve lately taken to scheduling one of these each week. There’s talk of another exhibition tour through South America, for just the two of them. This week’s match was billed as a one-match shoot-out, with the winner to earn a coveted place in the semifinals and the loser to depart in shame, or at least in a water-taxi. It all sounded terrifically exciting until one recalled that they played for precisely the same stakes last week in the Bercy quarterfinals. Indeed, those are the stakes everyone plays for every week. Somehow the logic of the round robin format has scrambled pundit’s brains. Anyway, it was a terrific match, at least in terms of drama. Quality-wise it largely confined itself to that wide channel between the lower bounds of the transcendental and the upper reaches of the execrable, only occasionally straying into both. Del Potro steamed out to a 5/1 lead in the first set, augmenting meat-and-potatoes rallying with an extravagant assortment of forehand errors from Federer. The Swiss eventually found his range, upped his pace, and came roaring almost but not quite all the way back. Federer’s early-set let-downs have now become sufficiently regular that even he no longer bothers to look surprised. He was duly broken at the start of the second set, but soon responded in kind. The standard lifted, and eventually a tiebreak arrived, at which point only Federer continued to lift, taking it 7-2. Del Potro appeared spent. Federer has built a forgettable season on his new-found conviction that momentum is but a fool’s conceit, and ensured he had none left for the third set by availing himself of a long toilet break. He was, predictably, broken almost immediately. When I say ‘predictably’, I mean precisely that. Tennis TV revealed some fascinating statistics that clearly chart Federer’s decline: since 2008 the likelihood of him being broken in the first three games of a deciding set has risen year-on-year from 61% to 100%. It was a perfect example of the obscure stat that tells the tale. Unfortunately no numbers were forthcoming on how often he recovers that early break. ‘Too often’ is undoubtedly del Potro’s feeling, although the Argentine didn’t help his cause with some very soft errors at inopportune moments. Federer broke late, the London crowd went bananas – remember how they were roundly excoriated last year for supporting Federer over Andy Murray – and he finally sealed a desperate win with one last ace. Del Potro had contrived to lose despite leading by a break in every set. It kind of felt like a final, as Federer admitted in his on-court interview, but it wasn’t. He had merely earned the privilege of facing Nadal, the latest instalment in a rivalry so putatively epic that it must be denoted with Roman numerals. Beyond that, it’ll be a one-match shoot-out to the death, otherwise known as a semifinal. Btw, given our shared appreciation for Nadal as an extremely talented tennis player and not as a brawny beast that wins just by flexing his biceps, I thought I’d mention something that hit me the other day. People keep forgetting that Nadal’s not left-handed! Yet he hits some of the most virtuosic and awe-inspiring shots the game’s ever seen, and generally has more technical variety than most other players. He does this with his non-preferred hand! A hand he can barely write and throw with. I think this above all shows how he’s incredibly talented/gifted, and not just a beast that pummels his players into submission. Uncle Toni was recently quoted as saying it’s a myth that Nadal is not left-handed. And in his autobiography, Rafa states that when he switched from the two-handed forehand he’d started with as a young boy, it felt easier to go with his left hand.